Munchkin Zombies remains an evergreen Munchkin hit – the fans liked it so much that it’s gone back for six printings in less than three years! And they keep asking for more! 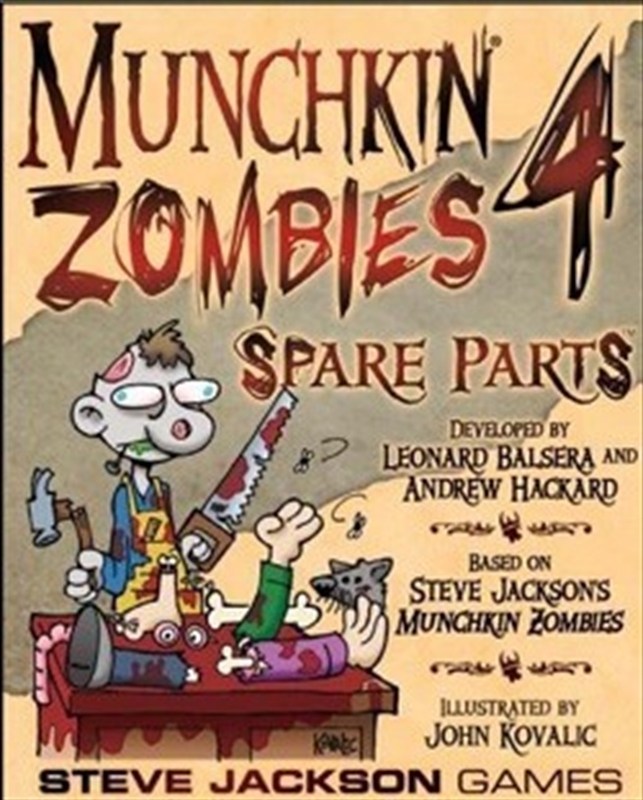 Munchkin Zombies 4 – Spare Parts includes 56 new cards for Munchkin Zombies. Players can take on a new Power, Solo, and show the other zombies on the block who’s boss. They get fun new Items like Spare Parts and Bowling Gloves, and take on hilarious new monsters like the Surgeon General and The LARPing Dead! Description: 56 cards in a tuckbox. Related Products: Munchkin Zombies, Munchkin Zombies 2 – Armed and Dangerous, and Munchkin Zombies 3 – Hideous Hideouts, plus the entire Munchkin line! • This set includes a new Power, Solo! • More great John Kovalic art, and lots more zombie jokes! • Designed by industry vets Leonard Balsera (lead developer of The Dresden Files RPG from Evil Hat Productions and Munchkin Tricky Treats) and Andrew Hackard (lead developer of Munchkin Pathfinder, lead editor of GURPS Basic Set, Fourth Edition.